Goose Foot Street Furniture is continuing its close working relationship with Blackburn & Darwen Council after being approached to supply new picnic sets for Roe Lee Park. The Tula picnic set blends seamlessly into the parks’ environment and allows for increased usage of the open space. Inspired by the strength and rigidity of 21st-century airframe construction, the hot-dip galvanised, colour coated mild steel picnic set is engineered to combine rugged all-weather performance with an ergonomic profile that provides excellent support. For the UK’s increasingly urban population, parks are often the only green space where people can meet, play, relax and come close to nature. The regeneration of our parks and public spaces is now back at the top of many council’s agendas. 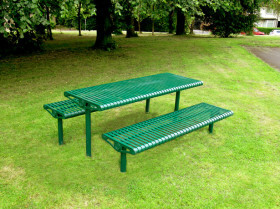 Graham Wood, General Manager of Goose Foot Street Furniture said: “We were delighted when Blackburn & Darwen Council selected Goose Foot to supply the new picnic sets to Roe Lee Park. At a national and local level, we are being encouraged to spend more time outdoors and the provision of a picnic area certainly aids this. Goose Foot is now widely recognised as the ‘go-to’ supplier of bespoke street furniture for all types of urban regeneration projects. We have recently worked closely with a variety of landscape architects and tier one contractors for projects in Colwyn Bay, Folkestone, Felixstowe, Preston, Blackpool, Wrexham, Southwark and Wolverhampton. Many of our nation’s best-loved green spaces are in need of continued regeneration and investment. Aiming to facilitate this, the Heritage Lottery Fund have awarded over £620 million in parks across the UK since they began their investment in them in 1996. Goose Foot is currently experiencing a significant increase in the number of orders being placed for bandstands and gazebos. Graham added: “With more than 30 years’ experience manufacturing large structures for public space entertainment, Goose Foot is a market leader in this sector. Bandstands are recognised as focal points for people in parks, retail/commercial/urban environments. These contemporary or traditional structures can be off the shelf or bespoke designed to meet the client’s requirements. Goose Foot is happy to provide advice and quotes if you are looking to create a focal point in your park or public space. Please contact us today to discuss your requirements!